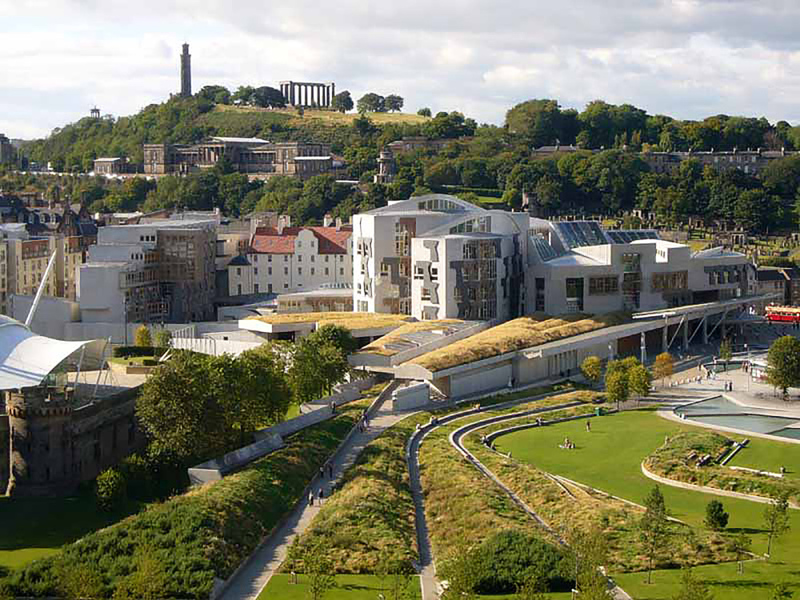 Democratic Resonance emerged from the artist residency in the Scottish Parliament undertaken collaboratively by Zoë Irvine (sound artist) and Pippa Murphy (composer). For an extended period the two artists explored the building in sound, walking and talking. Their sonic curiosity inhabits a crossover territory between documentary field recording, ethnography and musical composition. This time of discovery was in the year prior to the Referendum on Independence, a very particular and heightened time within the building and country as a whole. Recorded conversation was an important element. The artists met with many different people who work in the building and began to get a sense of all the different activities which contribute to the working of Parliament. The basis of Democratic Resonance lies in the building’s different acoustics and the idea of the fabric of the building being a resonator of the activities within. The piece was installed in a meeting room in the Scottish Parliament during the Festival of Politics 2015. The meeting rooms represent a threshold space between the public and MSP areas of the building. It is a meeting point and an interface. During the Festival of Politics it is also a thoroughfare. The piece aims to bring to the listener a sonic experience of different spaces and times in the working life of the building. Recordings used in the piece come from the corridors, hallways, basement and courtyards. The sound reflects from Kemnay granite, Caithness flagstone, Scottish oak, Italian marble, glass, concrete, carpet. It circles in the stairwells and lift shafts and resounds through the kitchens, corridors, hallways, basement, chamber and committee rooms. The artists would like to thank all the participants and the Scottish Parliamentary Corporate Body for hosting the residency and the installation. The residency was supported by funds from Creative Scotland. Thanks also to Edinburgh College of Art, University of Edinburgh for the loan of equipment and Duncan of Jordanstone College of Art, University of Dundee for research support at the start of the residency period.